Lady Gaga’s Lupus Surprise. 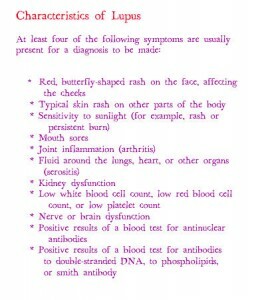 What is Lupus anyway? | Why Kan't Doc Zoe Write? Could Lady GaGa’s collapse, palpitations, and difficulty breathing be flare-ups of lupus and not a result of being overworked? SassyQarla’s Carlo Diokno and Rumer Certeza recently reported on Lady GaGa’s confession on Larry King Live about being tested for Lupus. According to GaGa, her aunt Joanne died from complications of the condition. She got tested for this which later came out to be borderline positive. She claims she is not exhibiting symptoms at the moment, was also reported to have been collapsing, having heart palpitations, and had trouble breathing while in Tokyo. Could these be flare-ups of lupus and not a result of being overworked? Systemic Lupus Erythematosus (SLE), or Lupus, is an autoimmune disease. This means your own immune system which normally defends you from bacteria or viruses, will instead attack your own tissues. The result of which is inflammation which causes swelling, pain, and tissue damage throughout the body. Pathogenic autoantibodies are the underlying problem in lupus, along with other unknown factors. The abnormal cellular and humoral response to the formation of these autoantibodies is modulated by genetic, environmental, and hormonal factors. In the United States, the annual incidence of systemic lupus erythematosus averages 5.1 per 100,000 per year. In addition, the incidence of SLE in black women is approximately 4 times higher than in white women. SLE is also more frequent in Asian women than in white women. In women of child-bearing age, a triad of fever, joint pain and rashes whould suggest the diagnosis of SLE because these are some of the most commonly found symptoms in patients presenting with SLE. Other characteristics of Lupus include photosensitivity, mouth sores, kidney problems, heart and lung problems, and neurologic problems. As you can see, because of the number of characteristit can be seen in other diseases, the diagnosis of SLE can be difficult. However, some laboratory exams can help confirm the diagnosis. Blood tests, urinalysis, or other tests can be done. Treatment depends on which organs have been affected and how active the inflammation is. If SLE is not very active (i.e. it’s mild), treatment may not be intensive. In severe lupus, treatment may be intensive. Once the initial inflammation is controlled, a doctor determines the dose that most effectively suppresses inflammation over the long term. Lupus tends to be chronic and relapsing, often with symptom-free periods that can last for years. Flare-ups can be triggered by sun exposure, infection, surgery, or pregnancy. The life expectancy, though, has improved – a 15-year survival rate of 80% today compared to an approximate 4-year survival rate of 50% in the 1950s. A patient in whom SLE is diagnosed by age 20 years still has a 1 in 6 chance of dying within 15 years, most often from lupus or infection. After 35, the patient is more likely to die from myocardial infarction or stroke. So is Lady GaGa exhibiting signs of SLE? That’s a question that only GaGa and her doctor can answer for now.